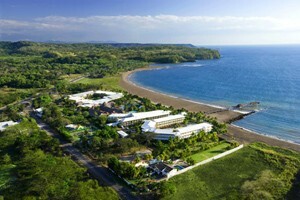 Fiesta Resort All Inclusive is an all-inclusive vacation spot, positioned on a stretch of small coastal inlets, near the port town of Puntarenas in Costa Rica. With a full range of facilities, from a casino to a children's club, this beachfront resort, situated on 25 acres of lushly landscaped grounds, is popular with all ages. Days are packed with sports, games and contests, while nights are filled with music and dancing; guests can lounge in a hammock, relax in one of four large, meandering pools or stroll the exotic volcanic sand beach. Whether it's family fun or a romantic getaway, everyone is sure to have a memorable experience at the Fiesta Resort All Inclusive. Located two hours away from the Daniel Oduber International Airport (LIR) in Liberia, Guanacaste, and 70 minutes from San Jose's Juan Santamaria International Airport (SJO). Whether you come from Guanacaste province or from the Central Valley, both drives are especially scenic and provide a sense of what the natural surroundings are like. The hotel is a proud member in the Certification of Sustainable Tourism Program and has been awarded the 'three-leaf' rating. The scenic volcanic sand beach has been designated with the country's prestigious Blue Flag Award. 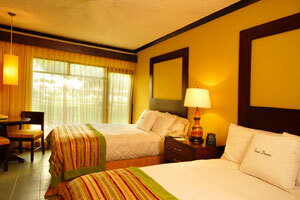 The resort is within just a few hours' drive of the best of Costa Rica's ecological treasures. 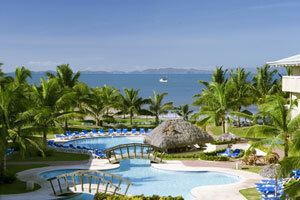 Puntarenas is one of several provinces you'll want to visit during your Costa Rican holiday. You have easy access to nearby fascinating eco-sites including Monteverde Cloud Forest, Carara Biological Reserve, Tree Top Canopy Tours and Arenal Volcano. It's the perfect 'home base' for exploration and adventure. All guests will enjoy famous chocolate chip cookie welcome!